Come celebrate Easter with Muddy's! Gather your friends and family and get ready for some cookie decorating fun!!! 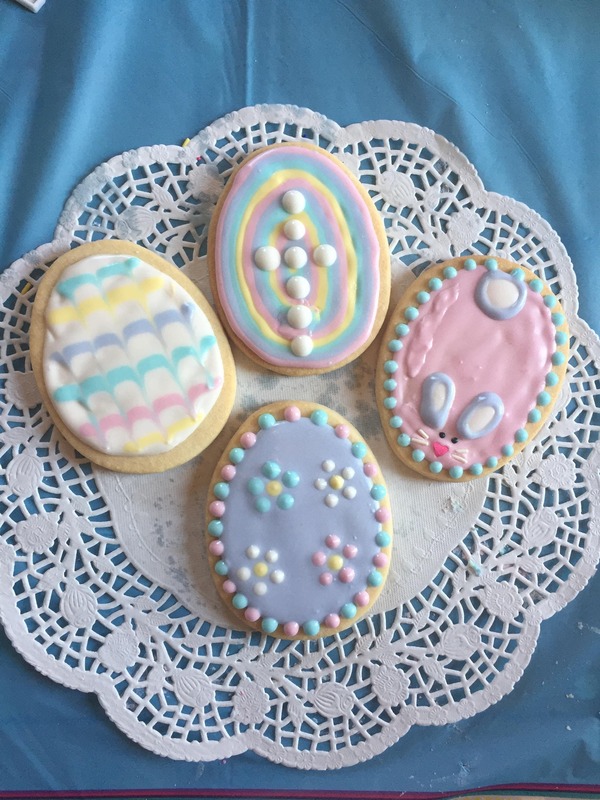 Try your hand at decorating not two, not three, but FOUR Easter themed cookies!!! Cookies, icing, and sprinkles are provided as well as complimentary tea! Have a great time with people you love and leave with your very own creation that you can EAT! Sign up now! Seating is limited. Is this a proffesional decorating class where I'll learn icing techniques? Our number one goal at our cookie parties is to have FUN! ...Because after all...this is a cookie PAR-TAY...not a professional class! A few general tips for icing are given, but instead of a step by step approach we allow everyone to get creative and see where the cookies take them! If you contact 7 days or more before the cookie party you will recieve a refund. Because seating for cookie parties is limited and seats tend to go quickly we need enough notice to try to contact someone on our waitlist. How long does the actual cookie party take? We allot 2 hours for decorating, some people finish in 30 minutes and some use the whole 2 hours, it's up to you! Who are the cookie parties for? Everyone, young and old! We love to see people in the community having fun at Muddy's! Bring a friends or family, or come solo! Can you have a private cookie party? Of Course! We'd love to have you! Contact events@muddysbakeshop.com for more details! Do I sign up for the number of cookie decorators or the number of attendees? How old do you need to be to attend a cookie party without an adult on site? Children under 16 will need to have an adult on site.